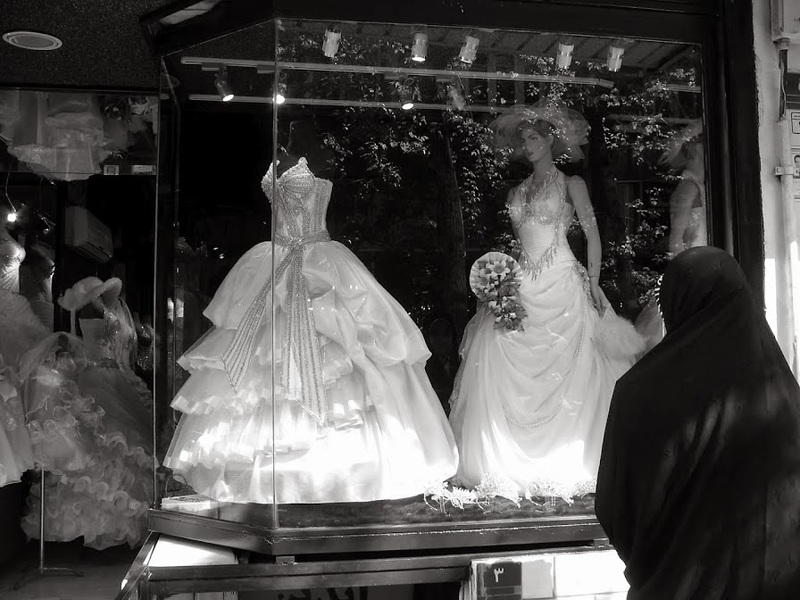 A woman window shops outside a wedding dress store in Tehran, Iran. Commenting on the then-recent mangled media coverage of the growing popularity of ninjitsu among women in the Iranian city of Karaj (the female martial arts practitioners were dubbed “ninja assassins” by Britain’s Telegraph), Shams pointed out that the Western stereotype of the Iranian woman has long relied on their portrayal as either “veiled, militant fanatics” or silenced victims of Islamic patriarchy, bubbling under their hijab – if not bursting out from under it - with exotic sexuality. This latter trope has recently become ubiquitous in Western media. 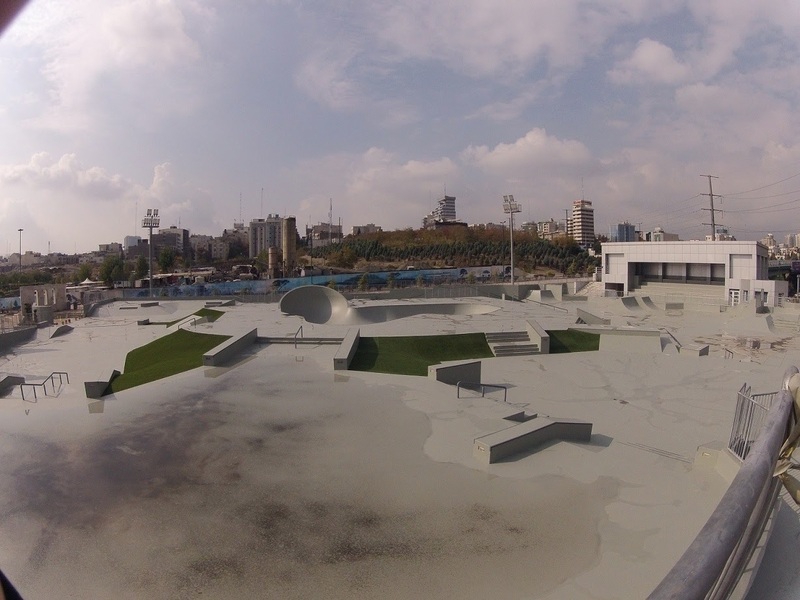 The individuality, creativity, and personal agency of women in Iran – and Muslim women in general – have all been subordinated, if not completely dismissed or disregarded, to the Western obsession with the Islamic veil. According to the routinely reinforced narrative in the American and European press, academia, and political discourse, the measure of a woman’s freedom and self-determination is directly proportionate to how tight her clothing is and how much of her hair is visible to strangers in public. Muslim women’s fashions have been interpreted and overanalyzed by the Western world as some sort of profound assertion of political identity or religious stance. Yes, there is an element of that in there, but the bigger truth is that Muslim women wear what they do, including what’s on their heads, because of how it makes them look and feel, just like all women around the world, and it takes on the cultural overtones of the milieu in which they live. There’s no need to survey this or pathologize it: there’s certainly no point in turning it into a value judgment. 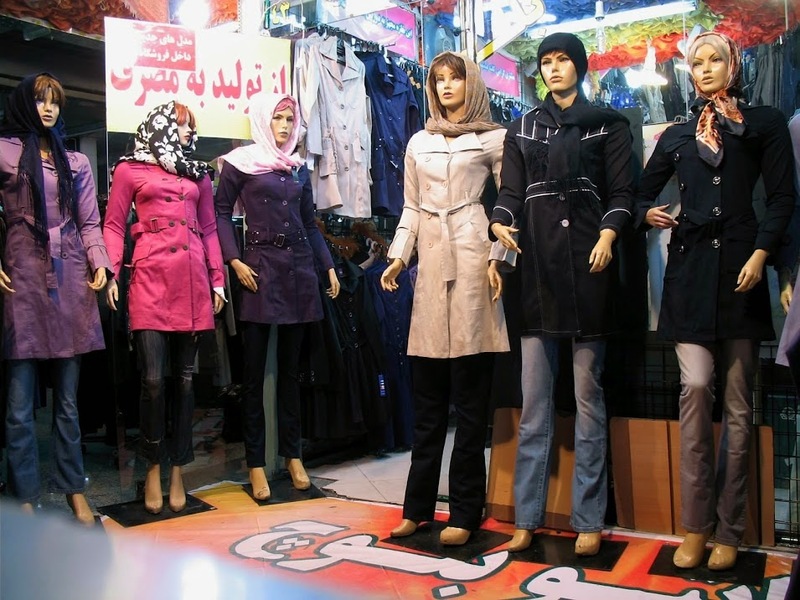 Nevertheless, the Western media continues to promote the notion that a “fashion revolution” is currently underway in Iran, wherein women deliberately and courageously challenge, defy and subvert the societal prescriptions – and proscriptions – of Islamic authority and government mandate as evidenced by the increasingly prolific image of “young, skinny, upper-class, colorfully-clad and trendy woman” in urban settings and headscarves that rest loosely on bouffant hairdos and tight top buns. Reliably, the folks over at Ajam Media Collective have dissected this media trend in all its Orientalist glory. of manteau, the long coat popular in Iran. 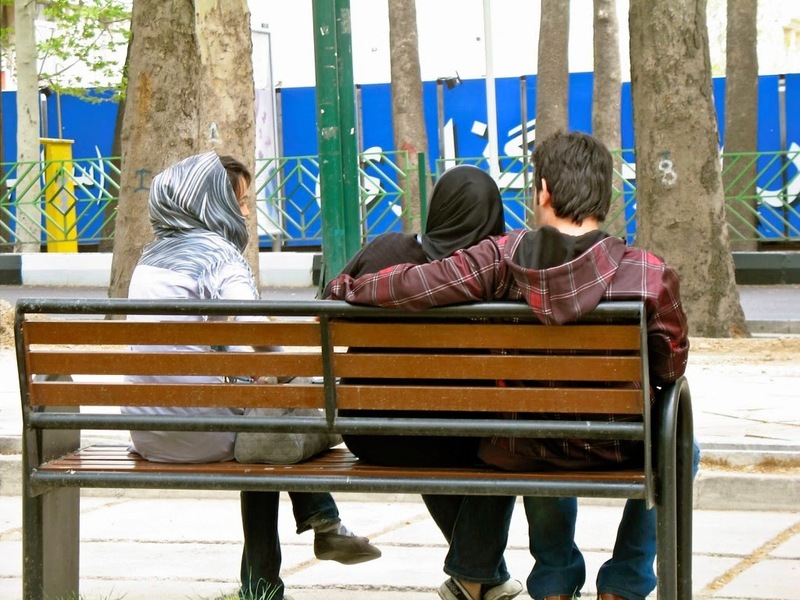 Young Iranians relax in Mellat Park in northern Tehran. An ever-expanding consumer culture in Iran has developed in lock-step with an upper-middle class subjectivity. Explicitly cosmopolitan, and performed through the consumption of global brands (Apple) and ‘Western’ cultural commodities (artisan coffee), it is also often marked through clothing. This subjectivity is not necessarily absent in lower socio-economic classes, and we are not suggesting that the “revolutionary” aesthetic that these articles exhibit is not to be found in lower-income neighborhoods. But class does necessarily determine the capacity to inhabit and express this aesthetic, and is manifested in the universe of such brands and their knock-offs. 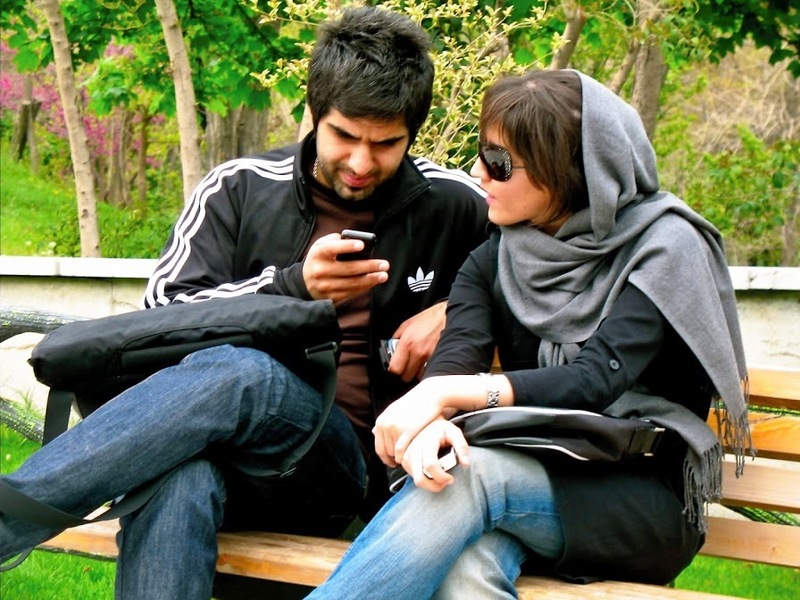 The embodied practices of fashionable-looking clothing therefore represents a trenchant consumerism that cuts across class lines in Iran, but also highlights them and makes them socially legible in doing so. Read Houshyar and Sarmadi’s entire article here at Ajam Media Collective.